Labour’s national executive committee meet next Tuesday to consider the Collins review of the party structure. Time has therefore run out to decide what is to be done to get Ed off the hook for the ill-thought through and ill-advised speech he made last summer after he’d had a pasting at PMQs and wanted to avoid getting another the next week. Falkirk is behind us now (though far from forgotten by Scottish trade unionists and workers at Grangemouth in particular). But for reasons unclear to me, Ed finds it necessary to be seen to be slashing non-existent union influence in the party rather than sack the advisers who got it so badly wrong. It is impossible to understand what is being proposed from media reports about how alleged union influence will be replaced by a new category of associate member. There are two reasons for this. Firstly, deliberate obfuscation by the party’s media managers: What Ed promised can’t be delivered without bankrupting the party. Had Ed spoken up for collective action and trade unionism as he should have done, the according to Tory writer and journalist Andrew Gimson (who drafted a very good speech), “he would have gained credit for courage and honesty, and would have begun to sound like his own man“. As it is, whatever can be cobbled together has to be spun as a great leap forward. The second reason is that the media simply does not understand how trade unions or the structures of the Labour Party are supposed to work. Labour correspondents have been extinct for decades. And under New Labour power was so concentrated at the centre, why would journalists bother to question the line the Leader’s spin doctors fed them? Patrick Wintour may, when a young reporter on the New Statesman, have accompanied Chris Mullin to the odd meeting of the Campaign for Labour Party Democracy, but that was over 30 years ago. the unions do not have a block vote in electing the leader – individual members of the union vote individually, and they have to declare they are supporters of the Labour party to cast the vote. As I understand it, that won’t change. Union members might be asked to tick a box making that declaration that they are Labour supporters in advance of getting their ballot paper, but it will be essentially the same declaration that would put them into a category described as “associate membership”. And it will only confer the rights they already have. Nor would those who didn’t tick the box lose their right provided they were prepared to tick the box in the future as they would have had to in order vote in a future leadership election even if the rules weren’t changed. Alan Johnson says at Progress that “asking voters to tick a box to say they support our objectives is not exactly a failsafe way to prevent outside interference” in these elections. Yet that is exactly what the “registered supporters” whose potential participation in such decisions Progress (and no-one else in the party) sought and were granted would do. And it is what voters would do in primaries which again Progress and no-one else in the party seek and yet Ray Collins may well recommend. as we saw in the last Labour leadership election, in practice the unions retain huge influence over how their members cast their ballots. All the major unions officially endorsed Ed. They gave his campaign access to their membership lists, but denied them to his rivals. They sent out literature directly endorsing his candidature. And one union even sent out the ballot papers with a recommendation they be filled in Ed’s favour. This is nonsense. Union leaderships (not just their general secretaries) do have some influence in leadership elections thorugh their ability to campaign, but not much. In 2010 the unions voted 60/40 in favour of Ed whilst the CLPs voted 54/46 in favour of David – a significant difference of 28%. But in 1994, when Tony Blair beat John Prescott of whom the union leaderships were almost as supportive as they were later of Ed Miliband, the unions voted 52/28 in favour of Blair whilst the CLPs voted 58/24 in favour of Blair – a very much less significant difference of 10%. Even in 2010 some of that 10% difference will have been because trade union voters felt a far greater affinity with ex-seafarer Prescott than public schoolboy Blair. The reason the gap was so much bigger in 2010 was not because Tony Woodley and Paul Kenny had much more influence than Bill Morris and John Edmonds. It was because after 14 years of Tory rule trade union members felt Blair had a much better chance of winning, whereas after 13 years of New Labour hobnobbing with the rich and famous and showing no interest in trade union issues, they didn’t want another Blairite. Right-wing unions like USDAW (64% for David in round 1) did vote differently from centre/left unions like Unite (50% for Ed in round 1) of the GMB (50% for Ed in round 1), but the politics of the union does, oddly enough, reflect the politics of the membership. The real reason David Miliband lost the election is that even where he had strong support, like in USDAW, he was so over-confident to the point of arrogance and made so little effort that in USDAW (only slightly smaller than the GMB and Unison in the electoral college) turnout was only 4.3%, the smallest of any union and less than half the 9% average. Every union has right-wing activists and officials at least at regional and local level who do have access to the membership – David Miliband simply didn’t bother to make enough use of them. The Progress opposition to OMOV voting is pure hypocrisy and self-interest. It doesn’t want to lose MPs from the college because the parliamentary party is their power-base. But since OMOV elections of party members are how both other major parties elect their leaders — the Tories after a preliminary ballot by their parliamentary party and the Lib Dems from nominations made by their MPs, as Collins is to propose for Labour. However, not everyone on the Left will welcome this move to OMOV voting. A senior CLP representative has told me that it means union members who pay £3 a year to the party would have greater weight than a party member who pays £45. Actually, though that may turn out to be a common perception, it isn’t true: if you aggregate the 122,806 valid CLP votes in the final ballot of the 2010 leadership election with the 199,671 in the trade union section, 38% were cast by individual members. However, many of these individual members are also members of at least one affiliated union and maybe one or more socialist societies. If one quarter of individual members cast one such vote each, after eliminating multiple voting (which everyone agrees shouldn’t happen), CLP members would account for 45% of all votes. In practice, therefore, individual members would probably account for at least half the votes in a future leadership election on the basis it appears Collins is likely to propose, with turnout presumably down from the 2010 level as the electorate would presumably reduce in size. Some of us would argue that the strength of the democracy in this process is not only – not even mainly – about the precise electoral structure, but more about the accountability provided by other aspects of the process. Such as the frequency and timings of elections, the nominations process, how easy it is to trigger an election against an incumbent and so on. Prior to 1981, when MPs alone had elected the leader, leadership elections were held every year when in opposition. When the electoral college was introduced, this was partially extended to periods in government – nominations were sought annually which served as useful feedback on the leader’s performance, though an election could only be triggered by a positive vote at conference where there was a challenger. This continued until it was abolished by Tony Blair. Not after a public debate; not after a decision by party conference or any elected body. There was no discussion and no vote. They just suddenly stopped circulating ballot papers even though the rule book said they should. The rule book was finally brought into line with the practice — without any discussion or debate of course — by Ray Collins’ sleight of hand as part of Refounding Labour. Now reversing that would be a reform worth making. Not only would it enhance accountability, but it would replace the nonsensical and damaging potential for Progress to constantly undermine a leader they didn’t like by repeated ‘leadership challenges’ in t TV studios and off-the record briefings with a simple annual nomination process that would simply monitor genuine concern. All of this may be very interesting to party members. It isn’t of much interest to the public and there is a cost of living crisis going on which needs our attention. Nor will it be the most important aspect of Collins’s report. That will consist of the recommendations on the future relationship between the unions and the party, and on primaries. The first appears likely to consist of no change for now to the first but a review five years ahead which few of us wanted now and few of us will want just before the 2020 election. This is the greatest concern. The second is likely to be a recommendation to have primaries at least for the London mayor, which no-one apart from Progress, no-one wants and no-one in London has been properly consulted about. This should be opposed. Of those, more anon. The main thing about the hype and spin we’ve had so far is that it is, as Paul Kenny so delightfully put it, “a storm in a Westminster claret glass“. 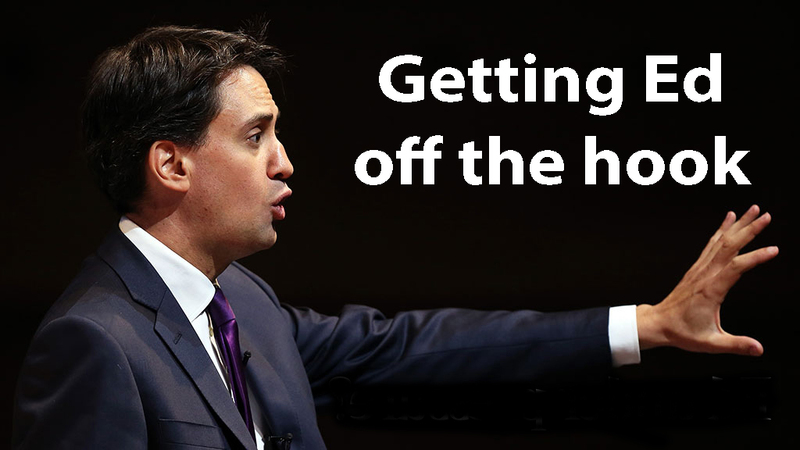 And those responsible for the hype and spin are the very people who got Miliband into the hole in the first place. Posted in: Activism, CLPD, Labour, Politics, Trade Unions. Is it not true, as our delegate just informed me, that this whole ridiculous process was started because EdM thought that there was going to be a party funding act before the next election and he felt he ‘had to do something’ first? Also, is it true that if a CLP did not send a delegate to the Party conference last year (probably because of the c £500 cost of travel and accommodation) they are disenfranchised for the Special Conference? Carol,you will have to ask Ed(privately!) for the answer to the first question.Every CLP is entitled to send a delegate to the SC and it does not have to be the same delegate as last year.As Jon says, it is pathetic to watch the Progress contortions over OMOV!! Paul K seems to have done a pretty good job in the negs.CLPD would like to take the idea of associated members further,in the interests of building a mass working class party.Why can they not have a role in choosing PPCs and even local cllrs. ?At the moment Progress, with their Sainsbury millions,manage to get their identikits into Parl.,way out of line with the size of their base in the Party,which is very small to say the least. Thinks someone needs to tell Collins that the only way that this would be acceptable is to ENSURE that the short list as selected by MPs contains a decent amount of candidates and that the nominations threshold for shortlisting is RADICALLY lowered from what it is today. Not a lot left of the labour party these days it’s been interesting listening to Reeves and her hammer and how Balls will cut even harder then the Tories so he can have a surplus. You have three choices these day all of them Tory, Tory the real, Tory the gimmick, and Tory Lite. I’m afraid I do not think any of them are much good. According to the Independent, there will be a threshold of 25% of MPs nominating a potential leader i.e. choice in 2010 would have been between the Miliband brothers alone. You say that and gets said that union bosses wouldn’t let other candidates have access to lists, then you say this is nonsense, but you just drew on other leadership elections from the past, you didn’t mention the 2010one, so why is what Hodges said nonsense? Time to end the sham call Labour Progress and elect John Reid as leader. CLPs select their PPCs. If union members join the Party as individuals, then they can take part in that selection. And all members of the Party can elect the Leader. With Primaries it may be possible for Labour supporters but not necessarily actual members of the Party, to take a part in the selection of candidates PPCs and Mayoral, which could open up the process a bit more. Thats to overcome the’incestuous’ cabals that have grown up in many CLPs over the years, often tightly controlled by very politically motivated people and families. Sounds good to me.